The Honda's only existing photo. Taken at 1000 Islands observation deck in Lansdowne, Ontario. 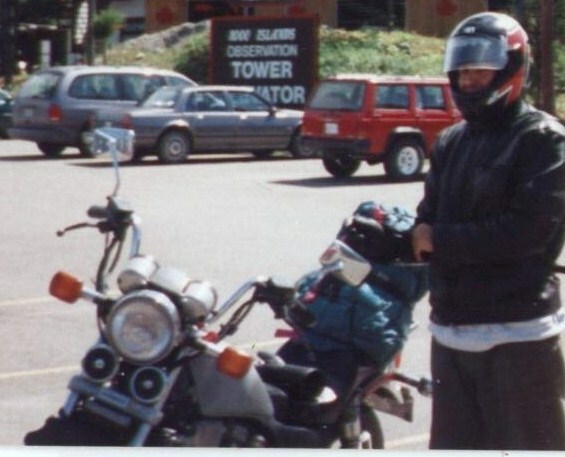 Over the years growing up, my father and I "stopped by" many motorcycle dealerships. We would peruse over the motorcycles discussing the mechanics and aesthetics. We both liked the early 90's Honda Magna. We even discussed buying one together to share, ride and enjoy. The question was, how can we both drive the same bike at the same time? That idea quickly diminished and we did not buy a new Honda Magna. My father found an 84' Magna V45 through a friend of a friend. The motorcycle was sitting for some time in someone's yard and the owners could not get the bike to start. The condition of the motorcycle was poor, rust and signs of neglect. My father and I could see the potential in the V45. We negotiated a price and the bike was ours. The 1984 Honda VF750C V45 Magna has a liquid cooled 748cc, 90 degree V-four engine. The V45 has reasonable power at 80.3 hp @ 9,500 rpm and torque of 46.2 lb/ft @ 8,000 rpm. A wet multi-plate clutch and six speed transmission deliver power to the shaft drive. Top speed is 122 mph. The Magna has a curb weight of 518 lbs. Braking is good with dual front discs and rear drum. The bike has 3.7 gallon fuel tank with the fuel consumption of 46 mpg. The Honda came to life after the basics were replaced (battery, plugs, oil, gas). It was that simple. The motorcycle didn't need anything to get running but some TLC. After a short test drive, a "small" flaw was discovered. Second gear was completely thrashed. Instead of breaking the cases and diving into the gearbox, I left the bike as is and learned to skip shift (skipping over 2nd) from 1st to 3rd while driving. This was a nuisance until I got used to this style of shifting which quickly became second nature. Exhaust: The previous owner installed a Kerker full exhaust system. The "muffler" had a nice sound to it. I am not sure if there was increased power gains over the stock system or not. Highway Pegs: A set of twisted wrought iron highway pegs came with the bike. They worked out well for long rides. Gas Tank: It originally had an 80's purple/rust color with a large dent on the right side. I filled the dent with body filler and finished with a flat grey primer paint. The flat primer added a nice touch to the bike and I decided to leave it as-is without final painting. I drove the Magna all over the Northeastern United States and into Ontario with no 2nd gear.